Kerry has been writing radio copy for donkey's years, & also dabbles in short stories & travel writing. She works, plays and explores largely in the CDB and inner suburbs, gets everywhere by public transport and is the self-professed Zone One Queen. It's Friday afternoon when your friend calls. "I need to tell you the latest. Where can we meet for a quiet drink after work? Somewhere in the city." Where indeed? It's the CBD, and it's Friday. Wine bars are bursting with suits, pubs are spilling punters onto the street. 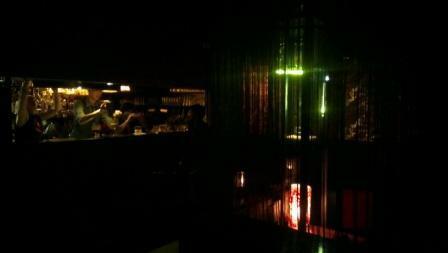 Even the establishments that are reputedly quiet during the week now have music pumping and not a spare seat in the house. As I stroll the city on a Friday evening, I can hear the roar of some venues before they come into sight. 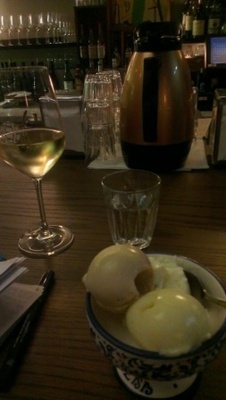 With a little reluctance, I will share with you my 'quiet drink' secrets. Use them wisely, and please—not for your rowdy office get-together. When locating a quiet venue, there are two obvious things to avoid. 1) Bouncers. Crowd control means crowds are expected. 2) Music. If you can hear the music while approaching the venue, it will be louder inside. This means many raised voices, which raises the overall volume. 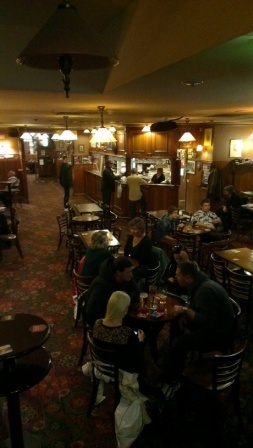 While researching this article, I approached The Gin Palace where I had enjoyed a quiet drink in the past. It had been years since I'd been there on a Friday night—but now it seems it is guilty of both of the above 'to avoid' factors. Disappointed, I kept walking down Russell Place, but my loss soon became my gain as I discovered a relatively new bar: Neapolis. See or be seen, in harmonious surroundings. Beyond the outdoor seating and behind a tall windowed facade, a wide bar is surrounded by stools. Customers sit not only in front of the bar but behind it, creating the feel of a communal table with staff working around it all. Upstairs, a mezzanine floor boasts one table for a large group and smaller tables lining a gallery, which culminates in a person-sized bird cage. The cage structure is in harmony with the grid of window panes, giving a certain Parisian 'je ne sais quoi' to the place. I don't know whether go-go dancers will ever appear in said cage, but right now, Neapolis seems to be a place of quiet convivial conversation. The music is very low and laidback, the vibe is relaxed, and most seating doesn't encourage a large entourage—all important factors in making an ideal 'Quiet Bar'. Don't overlook a hotel as a source of quiet enjoyment. 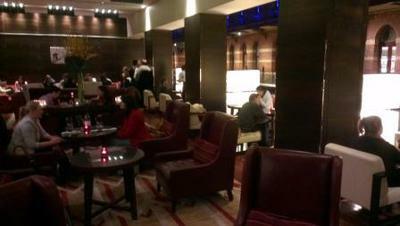 Many hotels have a bar in the foyer, and you don't necessarily have to be a staying guest. If you don't mind the passing trundling of suitcases, and don't require atmosphere, a hotel bar can produce seating and immediate service. The particular bar on my list, however, does have that special atmosphere created by being in an amazing space: the stylish Market Lane Bar, inside the fabulous 'Intercontinental 'Melbourne The Rialto', as it's officially called. The old wool stores, now a breath-taking atrium. 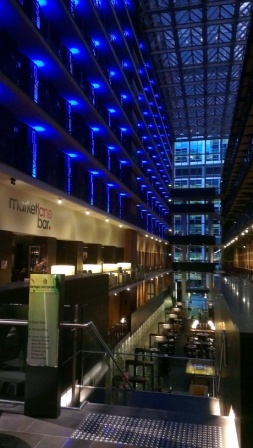 Entering the hotel's architectural space usually draws a gasp from the first-time visitor (I like to take people here). It reminds one of a classic 'prison' inner layout, but is in fact an atrium created to bridge two historic buildings that were once Melbourne's wool stores and offices. To find the Market Lane Bar, enter The Intercontinental from Collins Street, and veer left once through the foyer. Try for a seat on the internal balcony, where you can admire and experience your surroundings while browsing their selection of martinis and tapas. The 7pm buzz on a Friday night, and still seats to spare. Up easily overlooked Warratah Lane in Chinatown, Manchuria is one of my all time favourites. Being hard to find ensures the general street crowd does not stumble across it, even friends I have taken for their first visit have failed to find it a second time. Manchuria-seekers must look for the orange box above the door, traverse a dark staircase and approach the lion-headed door handles. Beyond these doors lies a dimly-lit Oriental-style parlour, delightfully divided into several sitting room areas, complete with curtains, candles and cushions. 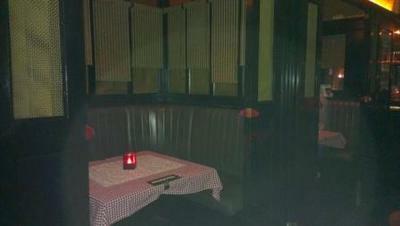 The intimate ambience of quality cocktails, fringed curtains, low lamp lighting. At Manchuria you'll be served where you sit, and the staff excel at cocktail making, with an extensive list to choose from. It is definitely the place to come for a special drink and an intimate chat. The music is 'loungey' and ambient, never too loud. Don't arrive too late though. 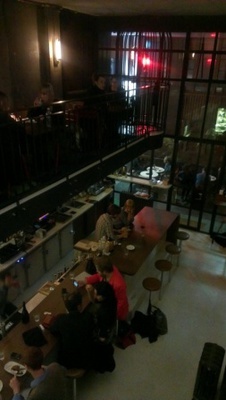 As Friday evening wears on, after the after-work crowd has left, a going-out crowd may arrive. When I say 'crowd', only once have I ever seen people standing around drinking. It is very likely you will find a pair of seats and a small table in some cosy corner, even if all the 'sitting rooms' are taken. 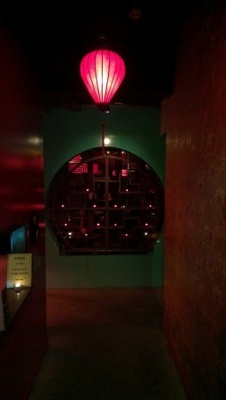 The Golden Monkey in Hardware Lane also possesses that "glamorous opium den" vibe. This is one that you must head to immediately after work—being quite well known, it can become packed by mid-evening. I have however included it on my Quiet Drinks list because of the intimate nature of the place. With its underground rabbit warren of wooden screens and seating and low lighting, there are many corners and nooks where you could chat to a mate or chat up a date. Just try not to get stuck beside a 'reserved' sign; a large group may land in your lap. Your private compartment awaits, at Carriage. Curtin House can get very busy. However, with good planning, you can book yourself one of the special 'compartments' that comprise the long 'train carriage' occupying the space. These compartments can seat no more than six people around a small gingham-cloth-covered table. Seat yourselves in there, slide the door closed, pull down the blinds and voila—privacy. Just be sure to ring and reserve your space in advance. Finally, I will mention a more traditional style pub. If this kind of drinking establishment is more your style, you may be hard-pressed to find a city pub that isn't teeming with rowdy young punters on a Friday evening. The Charles Dickens Tavern is one of those rare things, a 'hidden city pub', British style, without being hip or touristy. Being beneath the Block Arcade, it is away from the hustle and bustle of the street. Note though: the Charles Dickens has sports screens, so it can transform into a Noisy Bar when a good game is on. Outside of those times (and during a less popular match) I have been able to find a seat, enjoy some pub grub and a chin-wag. So there you have it. If you can seek these places out, you may be rewarded by a place to sit, a nice drink or two, and the ability to actually hear each other speak. Hopefully. Of course I can't account for these places being suddenly invaded by a nearby office or a hen's party—or a contingent of Weekend Notes readers. Why? Not everyone enjoys a noisy party crowd. Where: All within Melbourne's city centre. Cost: You won't get much change from $10 for one drink. Charles dickens hotel had the worst meals I ever saw! No value for money there !